Alright. We are a persistent bunch. 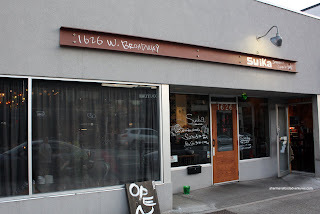 Last time we tried to visit Suika on a Monday after softball, it was closed due to a "staff meeting". As Bear put it best, "What kinda staff meeting closes a restaurant for dinner???". I'm not sure; but there must've been a good reason? Whatever the case, I made sure it was open this time by calling ahead. No epic fails this time around. We got a free parking spot and almost even got a table immediately. Persistence pays off. The newest venture from the people who brought us Kingyo, this little place on West Broadway brings the Izakaya experience to Fairview. The next closest Izakaya, other than in Downtown, is Hapa on Yew at Cornwall. colour and/or texture would've really made this a better dish. Now Boss Woman is not really into the raw stuff, so we tried to stay away from ordering any. However, there was no way around it when we got the Deluxe Suika Box. Although disappointing to her, I was secretly loving it since I prefer the raw stuff. 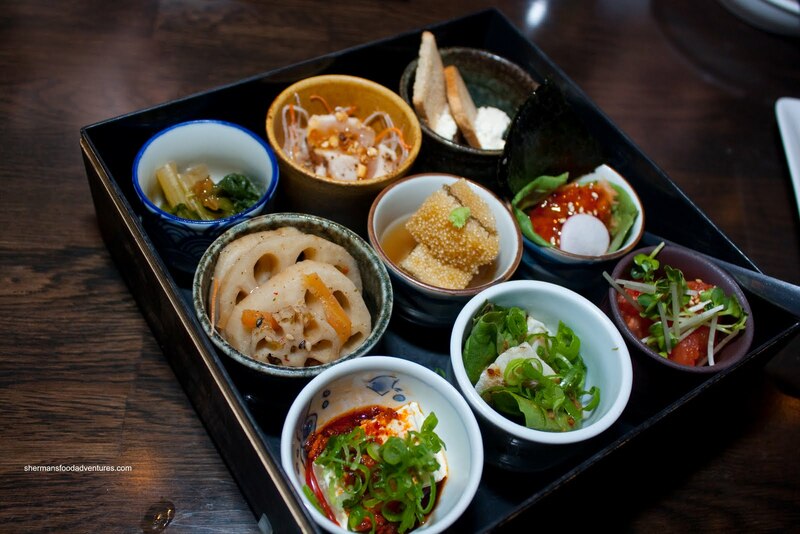 Included in the box starting on the bottom left moving clockwise was Hiya-Yakko, Lotus Root Kinpira, Pickled Veggies, Tuna Tataki, Cream Cheese and imitation lobster on melba toast, Salmon Tartar, Tomato Kimchi, Black Cod Salad and at the centre, Kazunoko (herring roe). 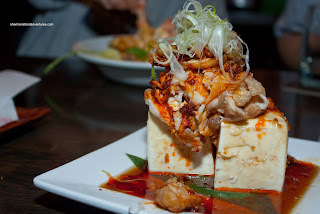 As large as the box may look in the picture, it is best to be shared by a maximum of 2 people along with other dishes. 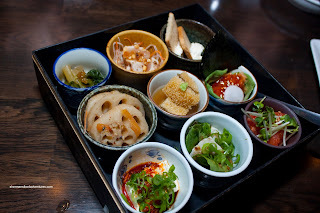 The highlights from the box were the herring roe (it was crunchy and fishy in a good way), salmon tartar (very smooth, sweet and well-seasoned), tomato kimchi (tangy, aromatic from the sesame oil and a nice pop of flavour) and the tuna tataki (prepared properly, sweet and fresh). You'll notice that I didn't include the tofu as on of the highlights. Well, we actually had a whole plate of it in the Tori-Yakko, which is the same as the box except with fried marinated chicken. If we look at the individual components of the dish, the chicken was very good. It was tender, flavourful and had a nice texture. The chili oil was tasty with a nice balance of spiciness, sweet and savoury elements. The tofu itself was smooth and went well with the other ingredients. However, we felt the tofu was too cold. Okay, I know it is supposed to be cold; but it was really, really cold. After we left it for a little while and came back to it, the dish was much better. Now for one of the standards - the Ebimayo. 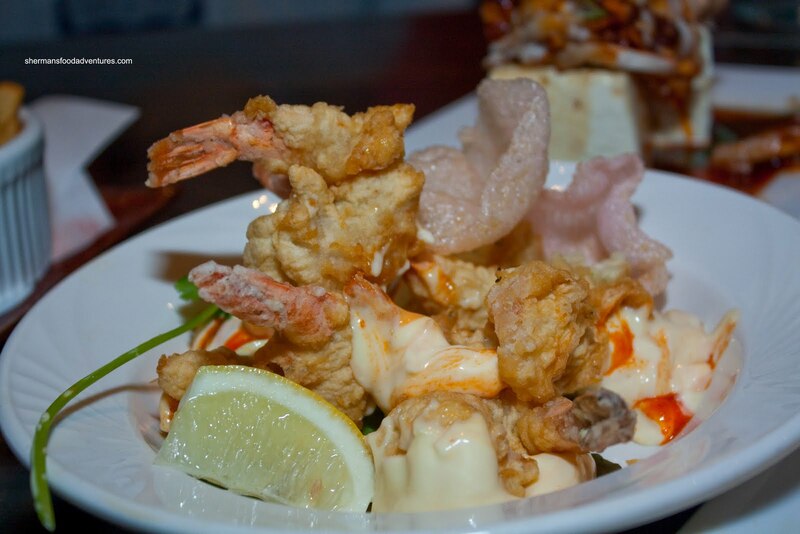 This was a good portion of large fried prawns accompanied by an obscene amount of chili mayo. However, that didn't take away the fact it was a good dish. 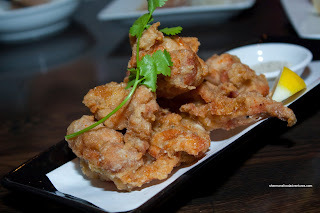 The batter was crisp and light (despite how it looks) and th e prawns had the desired snap texture. There was only a modest amount of chili which was fine by us since it didn't overwhelm anything. In the end, there was so much mayo, we used the rest for the Chicken Karaage. It went well with the large pieces of crispy fried chicken that was super juicy and moist inside. It was sufficiently seasoned that we really didn't need to use the salt on the side. With a squeeze of the lemon, combined with the chili mayo, it was delicious. 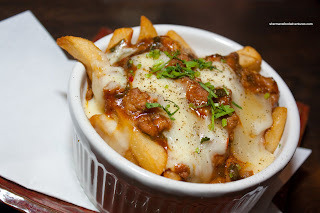 Something that caught our eye right away on the menu was the Chinese Poutine. Described on the menu as French fries topped with spicy ground pork sauce, mozzarella, chili oil, sansho and minced cilantro, this could've been a disaster. And it really wasn't. I was all ready to hate this because it reeks of fusion gone wrong. However, the poutine worked. 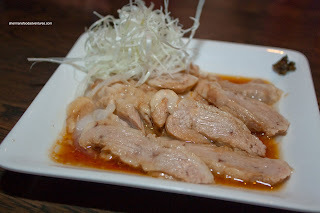 The pork sauce was sweet and savoury with a bit of a kick. 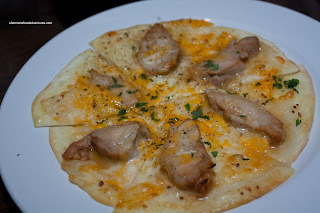 The meat was moist and not gritty while there was a good amount of melted cheese (not cheese curds I know). Now we all know that Izakayas are not exactly the best places to get full (and neither is the intention of such an establishment). 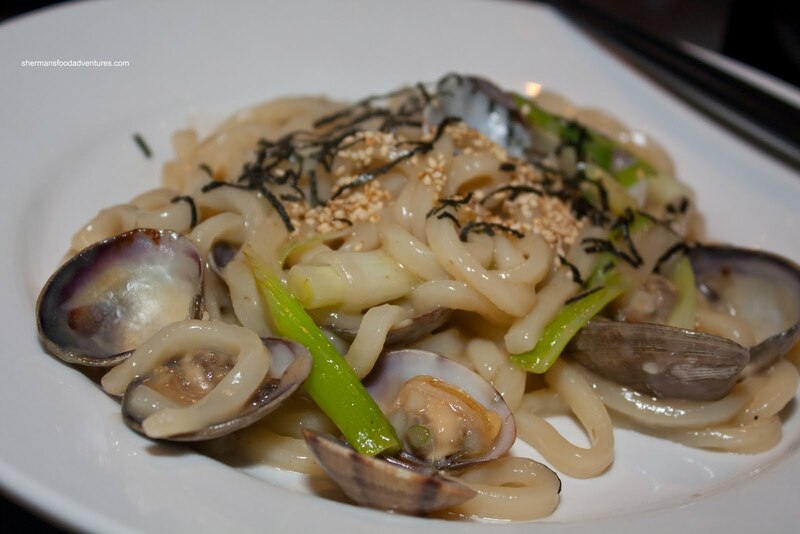 So we got 2 filler items starting with the Asari Yaki Udon. This was stir-fried with Manila clams and citron pepper. This was a very mild yaki udon where the noodles were still chewy while the ingredients didn't make much of an impact. Despite this, it was a pleasant dish nonetheless. For our second filler, we got the Kakuni Bibimbap served in a hot stone bowl. 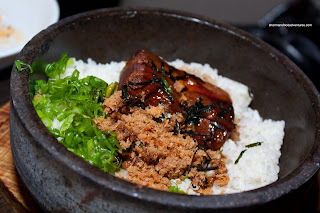 It consisted of rice, stewed pork belly, sweet dried shrimp and scallions. This was a winner and probably my favourite dish of the night. It was a good mix of flavours including the wonderfully prepared pork belly which added richness and depth to the perfectly cooked rice. The rice was still chewy; yet didn't develop much of a "crust" from the hot stone bowl. 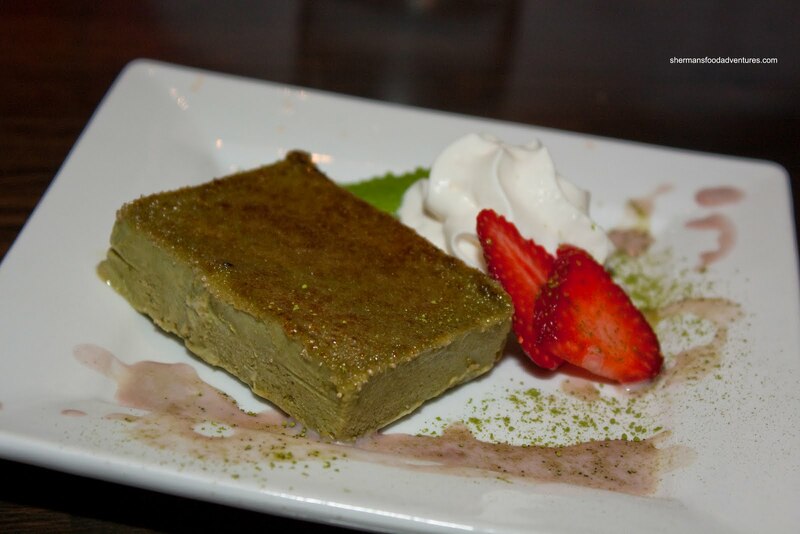 Lastly, we decided to try the Matcha Brulee which was frozen then torched on top. We loved the flavour, it was not too sweet and had a nice green tea essence. However, the frozen creme brulee was rather icy and didn't have a nice consistency. It didn't mean we didn't like the dessert, it could've been just a bit better with the texture. 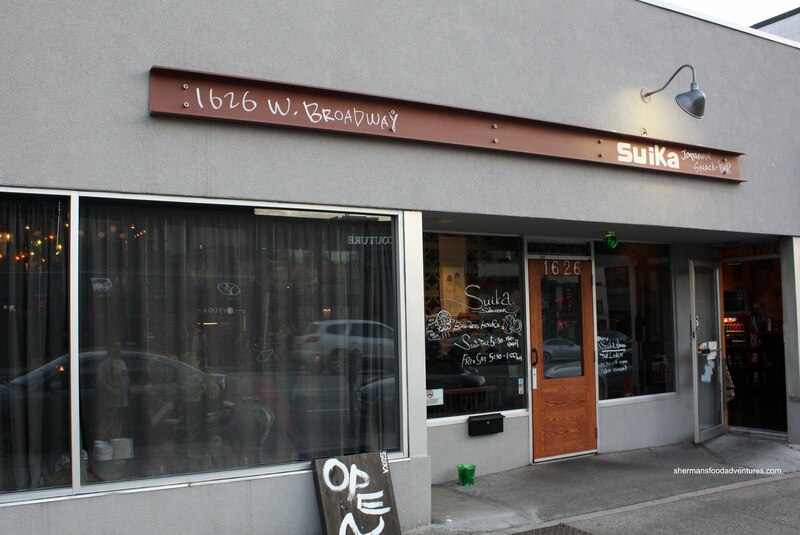 In the end, the food did all the talking here at Suika. Much like its bigger brother, Kingyo, the quality is top-notch. The service was also very friendly and attentive. There is obvious care and thought put into the food. Of course the cost can quickly add up since the portions are modest (you'll need 3 dishes each at least to be full assuming you are eating it for dinner). But as they say, quality comes at a cost.